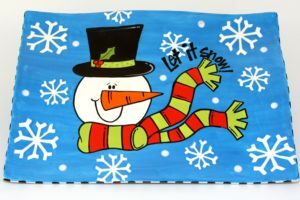 Just us this evening to make this Silly Snowman design on any platter or plate you'd like! $15 holds your spot and will be credited towards the item you purchase. This is a super easy design and will great for your winter goodies. Ladies Night starts at 6p.m.. As usual, we will also be open for any painting you'd like to do this evening.